The July National Team Training Camp roster and the 2014 US Secret Classic roster both had something very disturbing in common. 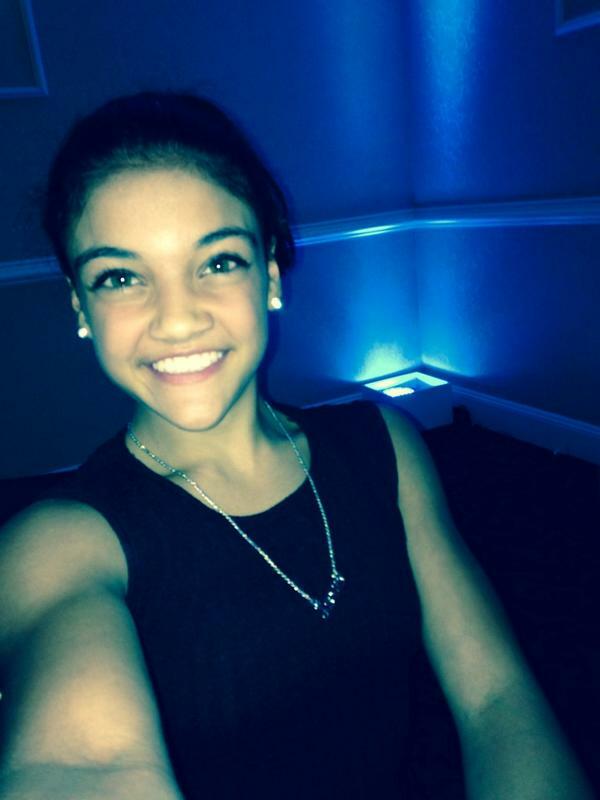 The were missing crowd favorite junior elite Laurie Hernandez of MG Elite. In fact, we will be missing her for some time. Hernandez rose dramatically in the junior elite ranks from 2012 to 2013, placing 21st in the all-around in 2012 at the national championships to second in 2013. She followed this up with some great international showings as well. With another year under her belt, many have wondered if she would be able to give Bailie Key, current 2013 Junior National Champion, a run for the all-around gold this year. But that will have to wait. Fortunately, time is on her side. Hernandez does not become a senior until 2016. Though two years is an eternity in the sport of gymnastics, she is currently on track to make a very competitive bid for a place on the 2016 Olympic team. Hernandez’s contagious smile, uplifting personality and crowd favorite floor performances will be missed in 2014. “She has been in the gym conditioning & I’m sure she will come back strong,” assures Haney. We can’t wait! Elizabeth Price ends her elite career with a gold in the all-around. Gymnastics. A sport about constantly reaching for perfection. And then reaching for even more. Setting goals – small goals that lead to large goals, large goals that lead to larger goals, that eventually lead to the elusive end-goal. Since perfection is not actually attainable, the struggle to define what those end goals truly are, and when you have reached them, is quite difficult. So choosing to go out when you are at the top of your game, yet have not actually reached the “normal” goals of elite gymnastics is not a decision we see often in the world of gymnastics. Right now, Ebee, as she is affectionately known to her fans, is the “it” gymnast. Many had declared 2014 as the Year of Ebee. She won the all-around in both international competitions she competed at early this year – the American Cup and the Pacific Rim Championship. She won the all-around in the FIG World Cup Series. She scored a career high beam score in March at the American Cup, and her career high floor score in April at the Pac Rims. Added to that were her two best all-around scores at the same meets, reaching within tenths of Simone Biles all-around score at last years World Championships. With injuries abounding, Price seemed to be a lock for this year’s World Championship team, and a definite top contender for the all-around world title. And though Price has accomplished so much internationally, winning four World Cup titles, these are goals she has never attained. In her first year as a senior, she was named as an alternate to the 2012 Olympic Team. In 2013, injuries held her back from being named to the World Championship team. And so it seemed an obvious choice that Price would defer her scholarship to Stanford for at least a year to make a run at this World Championship team, if not longer to work towards Rio. When you add all that up, it is as refreshing as it is unexpected to see Elizabeth Price retire from elite gymnastics this spring. Though she had not planned on Rio, it would still seem that deferring for a year to go to the World Championships in light of her current success would be in order. “Even though it made me a better competitor, it was really a decision that I wanted to move on from gymnastics. I felt like I had accomplished everything I wanted to with my elite gymnastics career. I don’t think worlds would make me feel any better of how well I did [as an elite gymnast],” she said. As a fan of gymnastics, I am most used to seeing a mix of heartbreak and success at the end of a gymnast’s elite career. Either not having achieved what they longed for, or having achieved it, then wanting to achieve it again and falling short. To see someone like Price, achieve more than she hoped for in elite gymnastics, and then keep her focus on HER goals (NCAA gymnastics) and move on towards those is quite refreshing. It is so wonderful to cheer her on with a heart full of happiness at all she has accomplished. 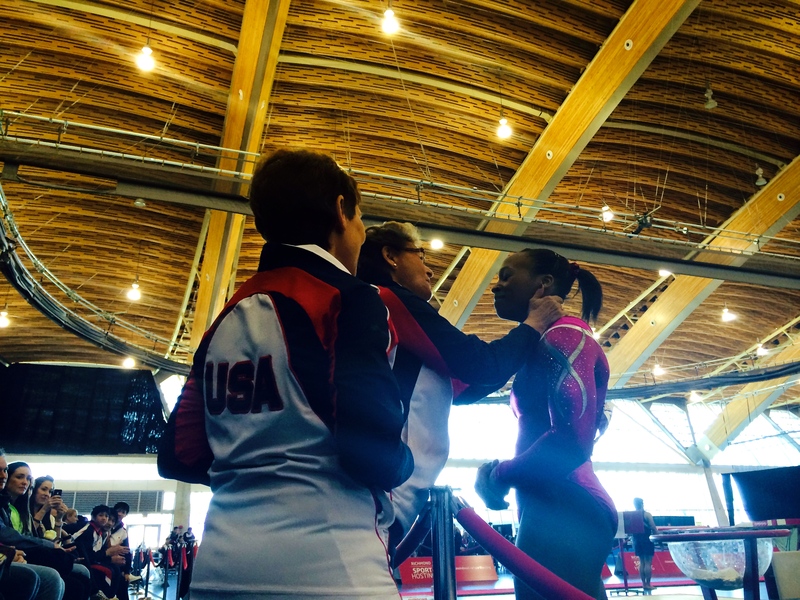 Martha Karolyi and coach Donna Strauss congratulate Elizabeth Price after beam. Price will be attending Stanford in the fall, and will no doubt dominate the NCAA scene. She currently competes some of the most difficult vault, bars and floor in elite gymnastics. Going into NCAA with that kind of difficulty and a healthy body will make her a standout for sure, and an incredible addition to the Stanford team. Price says she chose Stanford because it is a great academic institution with a great gymnastics team. 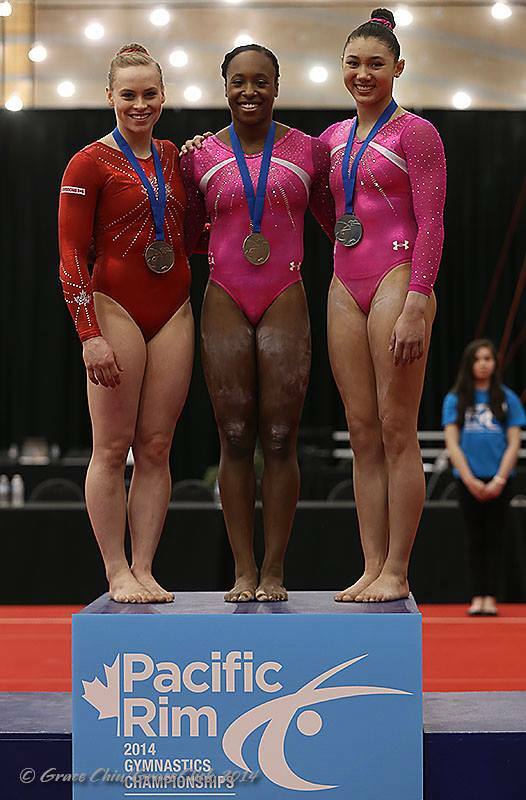 Here’s a look at Elizabeth Price’s last international elite gymnastics meet. Congratulations Elizabeth Price, for an incredible elite gymnastics career. We look forward to four more years! Aly Raisman has been shooting for a return to competition at the 2014 Secret Classics since her return to training last fall. She had taken a full year off from training after the Olympics and has been back in the gym for about seven months, working on a return to gymnastics. In the past, she has said that getting back into training the full number of hours she needs to train to return to her previous level of competitiveness has been her biggest challenge. Raisman has been adamant since winning her Olympic medals in 2012 that she wanted to continue to compete and planned to stay in the sport for the 2016 Olympics in Rio. Many gymnasts have found the path to returning to the commitment of intense training in the midst of fame and opportunities after winning an Olympic medal to be a difficult one. 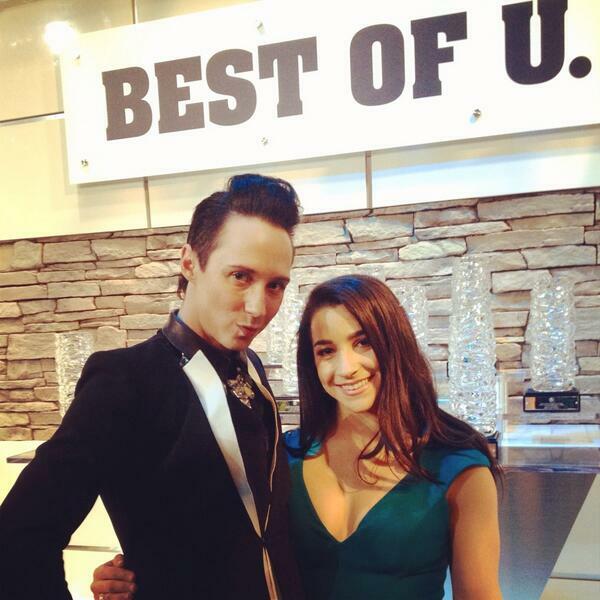 Raisman is no different, but seems to continue to press ahead with her goal, if more slowly than her fans would like. Simone Biles has been in the middle of turmoil and change over the last month. She has been dealing with a shoulder injury that caused her to pull out of the AT&T American Cup. Additionally, she and her coach announced a decision to change gyms. Martha Karolyi confirmed to Gymnastike on Sunday that Biles had been given the ok by her doctors to return to training and would be able to compete in the upcoming Pacific Rims Championships. Indeed, Biles spent her 17th birthday at the national team verification camp, where she hoped to make her case to be named to the Pacific Rims team. Today, the Houston Chronicle confirmed that the Biles family are in the process of building the World Champions Centre, which will become the permanent new training center for Biles and coach Aimee Boorman. In the meantime, they will be training at AIM Athletics in The Woodlands. AIM Athletics say that their goal is to “develop outstanding athletes who will deliver quality performances and a positive public identity to the community.” They want to “help each athlete grow as a total person and develop skills to better meet the challenges of a rapidly changing society.” This seems like a great environment for Biles in the midst of her own rapidly changing life. After the 2012 Olympics, Aly Raisman made it clear that she wanted to continue on in gymnastics. However, many opportunities led to a well deserved year long rest from training. She resumed her training – at a less aggressive level than most of her life – last fall. #TBT can’t wait to be back out there. At the 2013 World Championships in October, Raisman confirmed that she was back in training and was hoping to make her elite comeback at the 2014 Secret US Classics. This competition will be held in Chicago, Il on August 2. Gymcastic connected with Raisman in a phone interview back in February to check in on her progress. In the interview, Raisman said she is on track to compete at US Classics. The most challenging part has been getting used to all the hours of training again. She is exhausted all the time, but has that feeling of satisfaction. She is still working towards training the number of hours she was training before the Olympics. As to her training, Raisman said that her first few weeks back on the high beam was actually scary. “I forgot how narrow and high it was!” Tumbling on floor has been the easiest to get back, though she thinks it will still be a while before she will be able to do her famous first floor pass. Raisman feels like she will be able to come back better than ever. Her time on Dancing with the Stars helped her gain flexibility and a lot more confidence. Wearing heels all the time also helped her toe point. She feels wiser and more confident and more calm now. Yet she still loves gymnastics and “wants it” as much as ever. Check out the rest of the interview. It is 30 minutes of Aly Raisman sitting down and “gym geeking out.” A delightful time that includes her recounting of the evening after she qualified for the All Around at the Olympics and how Jordyn Wieber responded. Coming off of a great performance at the AT&T American Cup, Brenna Dowell and Elizabeth Price look to the future. They are both committed to collegiate gymnastics and were slated to begin competing NCAA this fall. 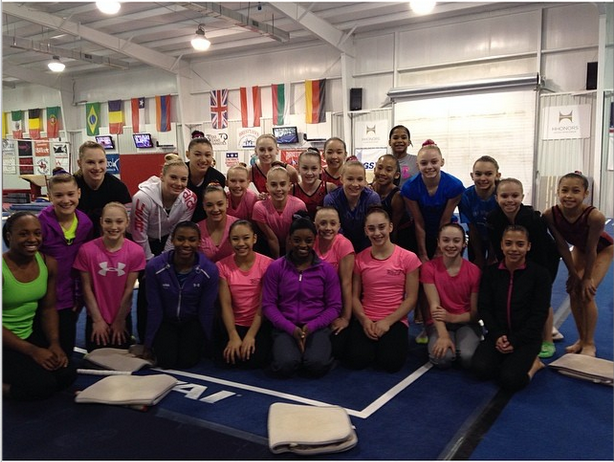 With a great showing at the American Cup, they are both strong contenders for the 2014 World Championship team. But will they still be competing elite in the fall to even make a go of it? Price is committed to Stanford. In January, she told Allie of Double Double Gym Blog that she had not yet decided if she would defer her scholarship until 2015. Stanford was one of my top choices for college ever since I started looking at schools, and I knew gymnasts that went there who told me great things about the school, so I knew a lot about Stanford even before I went to visit. I decided to go there because I felt that Stanford is a great academic institution with a great gymnastics team. I haven’t decided yet whether or not I’m going to defer until 2015, but I still have time to think about it and make that decision later. Brenna Dowell is committed to the University of Oklahoma. She talked about her college choice with Arabian Punch Front. I didn’t want to go too far from home. I wanted it to be driving distance so I visited a few schools that were close. I really like KJ and Lou. They were really nice and they made me feel like they really wanted to me to be on their team. I really liked the atmosphere and, from the people who I know that go there, I heard nothing but good things about it so I’m really excited to go. That seems like a good plan in a sport as precarious as gymnastics and in a country where it is harder to make an World or Olympic team than it is to medal once you are there. Simone Biles and Aimee Boorman on their way to practice. Photo from Triple Twist. A mild shoulder strain prevented Simone from competing in this weekend’s American Cup. The timing of her shoulder strain amongst the gym change led many to question whether or not Simone was actual injured or if she was pulled due to the turmoil. Aimee responded to those rumors on the Gym Truth Tellers blog. Hi Everyone! This is Aimee, Simone’s coachIt is true, we are no longer going to be at Bannon’s. It is also true that Simone does have a minor shoulder strain that we are taking care of to protect her for meets that will be later in the season. We try to avoid gossip, but we know that it will still happen. Rest assured that Simone’s training will continue, even with the change of venue. If you remain still, you will never grow, but sometimes growth is painful. Thank you to everyone for your support as we make this transition! One can only imagine the stress on a 16 year old to leave the only gym she has ever known and teammates who are like family. Many gymnastics fans wondered if there was something going on with McKayla Maroney when there was no footage of her from the last National Training Camp. And then when Italy posted the nominative list for the Jesolo Cup and Maroney was not on the list, this increased speculation. Marta Karoyli confirmed to Gymnastike in an interview following the American Cup that Maroney is indeed dealing with a knee injury. Karoyli told Gymnastike that Maroney started having problems with her knee after worlds and took some time off to heal. She started training again recently but was still having problems. They are now looking into treatment options (or as Marta put it, intervention). 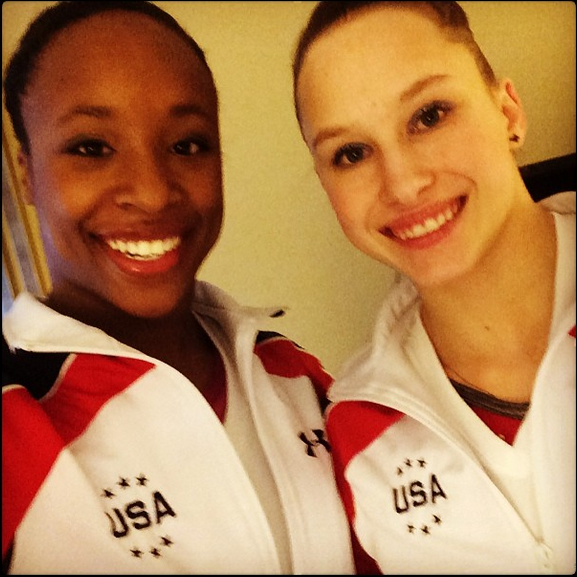 Check out the interview (including updates on the rest of the Fierce Five) on Gymnastike.